Landing-recovery crews with Boeing, NASA and the U.S. Army arrive at the mock landing site of the Boeing CST-100 space capsule during a simulation of landing procedures at the U.S. Army's White Sands Missile Range in New Mexico on June 6, 2018. 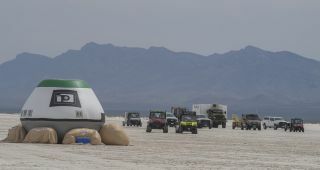 Search-and-rescue teams with NASA, Boeing and the U.S. Army hustled to assist an imaginary crew out of an inflatable space capsule at the White Sands Missile Range in New Mexico during a simulated recovery of Boeing's new commercial crew vehicle in June. Search-and-rescue teams with Boeing, NASA and the U.S. Army rehearse procedures for recovering astronauts from the CST-100 Starliner spacecraft on June 6, 2018, at the U.S. Army's White Sands Missile Range in New Mexico. Working in scorching temperatures of over 100 degrees Fahrenheit (38 degrees Celsius), the landing-and-recovery team drove a brigade of four-wheelers, trucks and trailers to the mock landing site in White Sands Missile Range. This is one of five possible landing sites that Boeing is considering for Starliner missions and one of two such sites within the White Sands Missile Range, Barrett said. Other options include the Dugway Proving Ground in Utah, the Willcox Playa in Arizona and Edwards Air Force Base in California. According to NASA's launch schedule, the Starliner is supposed to launch on its first uncrewed test mission by the end of August, with the first crewed test flight currently scheduled for November. However, those missions probably won't launch on schedule, SpaceNews reported. Boeing experienced an anomaly during a test of the launch-abort engines in June, and that setback "is expected to delay a pad abort test of the vehicle as well as its upcoming demonstration flights, but the company has not said by how much," according to the Space News report. During a simulation of recovery procedures for the crewed CST-100 Starliner spacecraft on June 6, 2016, rescuers used a cooler filled with water to weigh down the inflatable simulator. During the static-fire test of the four launch-abort engines, which are built in to the capsule to allow it to propel away from the Atlas V rocket booster in case of an emergency, a valve in the spacecraft's propulsion system didn't close properly, causing propellant to leak. The leak occurred during engine shutdown at the end of the test, which was otherwise successful, Boeing officials said in a statement. "Boeing is working with NASA to ensure that the CST-100 Starliner flies at the earliest time it is safe to do so," Barrett said. "Creating a new, human-rated spacecraft presents many unique challenges during the design, production, testing and validation phases. As we move through the development of the Starliner, we continue to mitigate risks and evaluate our schedule with NASA." Despite the strong possibility that crewed flights will be delayed by several months, NASA is ready to announce the names of the first astronauts who will fly on the CST-100 Starliner as well as SpaceX's Crew Dragon spacecraft, another private vessel that will start launching astronauts to the space station in approximately the same time frame — and is also running behind schedule. NASA officials will name their picks Friday (Aug. 3) during a live event on NASA TV.